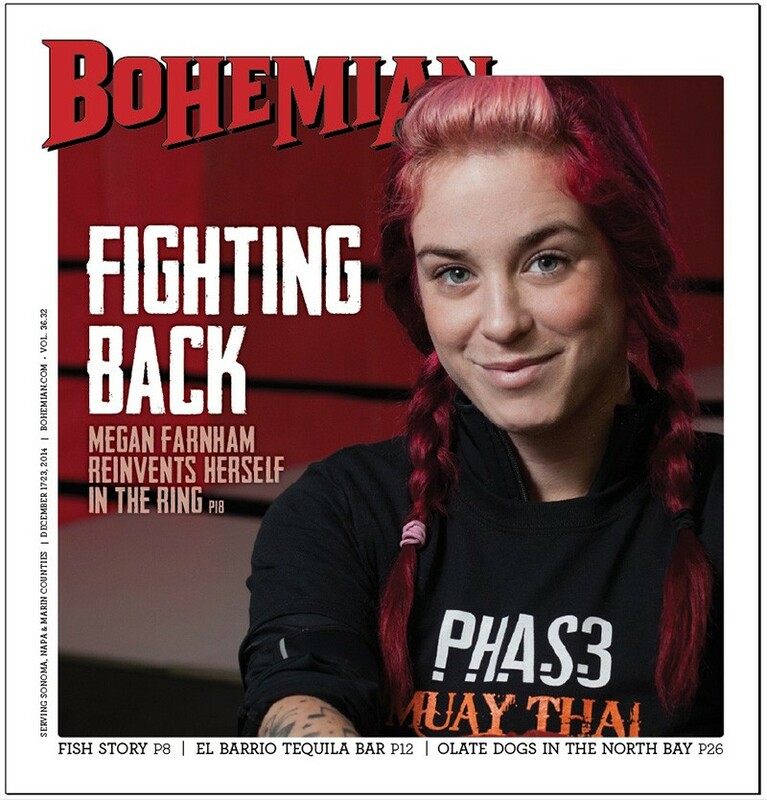 After years of self-neglect, Megan Farnham rebuilt her life around mixed martial arts. So why won't anyone fight her? Cameras flash from beyond the chainlink fence as the gray-jacketed announcer, a fight card in one hand and a microphone in the other, steps into the center of the cage. "First . . . introducing . . . fighting out of the blue corner . . . from Lakeport, California . . . weighing in at 122 pounds . . . Miss Amanda Brackett!" Bracket, in her corner, briefly raises her arms above her head, quickly adjusting her helmet and mouth guard, her eyes darting over to take in her opponent, a tattooed young woman now bouncing up and down on the other side of the combat area. "Next . . . fighting out of the red corner . . . weighing in at 124 pounds . . . from Santa Rosa, California . . . Megan Farnham!" It's Saturday night, Oct. 20, 2012—fight night at the Sonoma County Fairgrounds, a series of mixed martial arts matches featuring male and female amateur cage fighters. Though the video doesn't show the audience, from the sound of it, Farnham has a lot of fans out there in the stands. Cheering, whistling and whooping, the noisy crowd shouts their support at deafening levels, as Farnham stands in her own corner, waiting for the bell, mere seconds away from her first official cage fight. The bell rings, and the fight is on. Farnham, all focused energy and pent-up anticipation, throws the first couple of punches and the first kick. The fighters trade more kicks, more blows, blocking and bobbing as the battle gradually scoots closer and closer to the perimeter of the cage. As their kicks and punches catapult back and forth, the opponents circle each other, semi-waltzing at arm's length, now moving back through the center and over to the opposite side of the cage. Brackett pulls up a surge of energy and attacks Farnham with a barrage of blows to the body and face, driving her back for a brief few seconds. Farnham responds with her own re-energized attack, as if drawing inspiration from each strike she absorbs. Brackett begins to weary as her opponent drives her back across the arena, until a kick from Farnham is intercepted, Brackett holding on firmly as Farnham is forced to hop on one leg. But Farnham, after a few awkward seconds, turns the move against Brackett, forcing her competitor to the ground and gaining a firm hold on her from above. Brackett throws desperate punches that miss their mark, as Farnham pulls her to her feet and tosses her off. Moments later—after Bracket briefly drives Farnham to the fence—the fighter from Santa Rosa moves sharply forward, grabs Bracket by the arms, and throws her to the ground. Bracket rises quickly and steps into a fierce volley of punches to the face that clearly exhausts what remains of her determination. Driven back to the fence, Brackett feebly blocks the punches, absorbing a few additional kicks to the leg and stomach before turning and walking away from Farnham, who follows for a few seconds, not yet understanding that she's just won her very first fight. The referee, recognizing that Brackett is done, ends the match. "The winner, by referee stoppage—Megan Farnham!" In the video, the expression on Farnham's face, as she resumes bouncing, both arms raised above her head, is priceless. Farnham is grinning from ear to ear, not so much a look of triumph as an expression of gradually dawning awareness that after years of setbacks, disappointments and extremely hard work, this is what it feels like to be a winner. 'Ground and pound! That's when the fight has been taken to the ground, and now you're basically wrestling," explains Farnham, describing one of her favorite combat moves. "You're moving and striking, while not getting up. You're trying to hold them down, to pin them to ground and to strike them at the same time. Ground and pound!" It's two years after her first fight. As Farnham talks, she organizes a row of glasses tucked behind the bar at Jack & Tony's, where until recently she worked as a bartender. Having just learned she'll be fighting in December's Ultimate Reno Combat in Nevada, Farnham is clearly pumped up for a chance to fight again. Since 2012, she's been training hard, but has only landed a handful of fights. 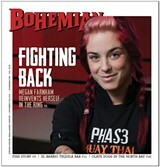 She remains undefeated, and is hungry for more chances to take her training to the cage. For some reason, though, in recent months, opponents have made a habit of withdrawing just before the fight, commonly citing 11th-hour injuries. One of her most recent matches-that-never-happened was a cage fight in Petaluma. With three different women lined up to take her on—all in the same weight class, with similar experience levels—Farnham and her trainers assumed it was a done deal and were preparing hard for the event. All three opponents declined to fight at the last minute.